Ductwork systems directly affect how well a heating and air conditioning system performs. If it leaks, lacks sufficient insulation, or wasn't properly designed or installed in the first place, you'll have comfort issues and excessive energy bills. Additionally, if the ductwork is undersized, it will lead to reduced air flow, which strains your HVAC equipment and prevents it from delivering sufficient air to all your rooms. At Santa Clarita Custom Air, we view our ductwork redesign service as one of the most valuable services we offer our Santa Clarita and San Fernando Valley customers. We understand the critical role ductwork plays in any HVAC system, which is why we have become experts in evaluating, redesigning, and replacing ductwork systems. Our technicians have all gone to trade school, have years of experience, and stay up to date on the latest and best industry practices. Over the last 27 years, we have served the heating, cooling, and ventilation needs of thousands of satisfied residential and commercial customers. Additionally, because of our honesty, high-quality service, and fair prices, we receive nearly all our business from returning clients and referrals. In order to give our clients correctly sized, high-performance air ducts, we carefully engineer them using ACCA Manual D (duct) and Manual J (load) calculations. In most cases, we replace asbestos, flex duct, or compressed fiberglass ducts with R-8 insulated ductwork, which is currently the best on the market. 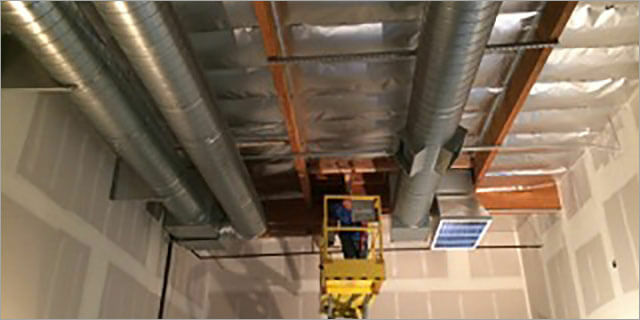 R-8 ductwork provides exceptional insulation for optimizing efficiency and lowering energy bills. We also have an anti-microbial ductwork for those with asthma and other medical conditions. Our ductwork redesign can also include adding or moving registers and supply grills, or creating a second, separate system (usually for very large or multi-story homes). Call family-owned and -operated Santa Clarita Custom Air today to have your ducts inspected by one of our HVAC technicians. In addition to ductwork redesigns, we can also provide ductwork sealing and repair, and can install additional insulation. Our ductwork services are available in Santa Clarita, Encino, Woodland Hills, Newhall, Saugus, Stevenson Ranch, and surrounding cities throughout Santa Clarita and San Fernando Valley.